Discussion in '2nd Gen. Builds (2005-2015)' started by tacosupreme54, Oct 12, 2010. 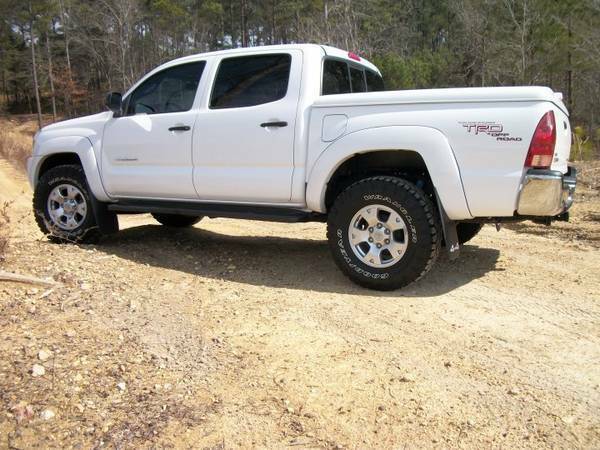 That's her, bone stock other than the cheesy running boards, grandpa tonneau cover, and duratracs. 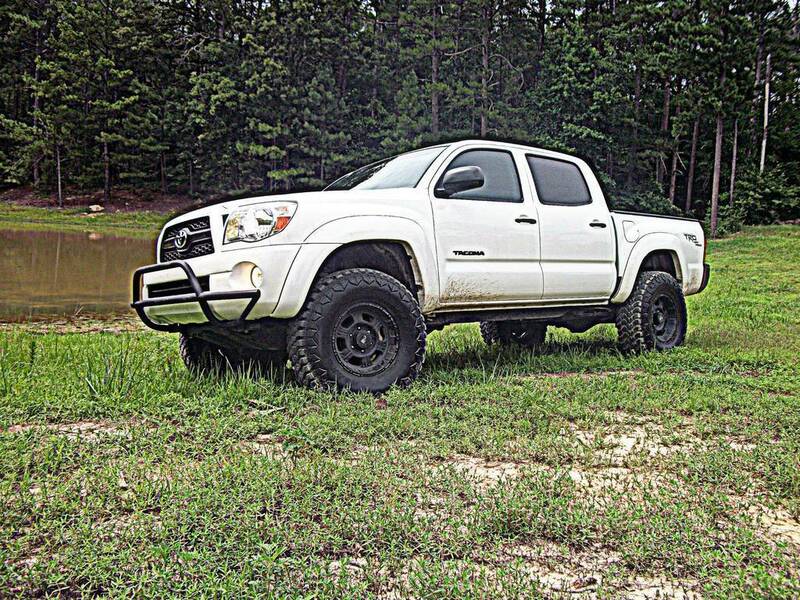 Summer 2010: 3" front spacers , 2'' AAL, removed extra emblems and painted "tacoma" and toyota badges black, black TRD Off-Road decals, removed tonneau, and turned blackwalls out. Over the first summer I had the truck I did these mods. I strongly advise staying away from spacers, as well as leveling kits if you are considering lifting. 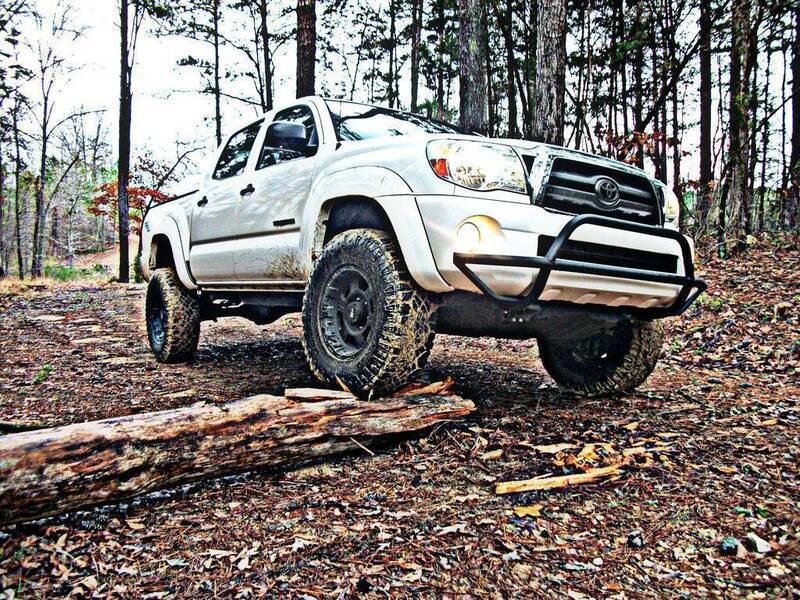 I can almost guarantee you will be changing it out soon for a real lift because it rides so rough. So save your money and do it right the first time. As far as the cosmetic mods I did, they are all simple and cheap ways to customize your truck and give it its own look. I had looked into lots of black wheels; from steel wheels to helo black maxx. I decided on Pro Comp 7089s to add to the black and white theme. A lot of people said the 16x8's wouldn't fit; that they would hit the brake caliper. I wanted a 16'' wheel, with more tire and less wheel. So I chanced it and got them. Anybody looking into those wheels, they will fit in the 16"x8". So don't feel like you need to get the 17" or larger to be safe. I did mainly just because I didn't use them and because they sort of negated the lift. Removing them and the flaps made it look "higher" and just cosmetically better to me. It looks good while adding some protection from minor fender benders, deer, dogs, pedestrians, etc. I got it in hopes that these small things won't crush my front bumper or anything important in the engine bay. It is a much better choice than a bull bar in my opinion; in functionality and looks. 3/10/11: Just some random pics on a light trail, also added magnaflow 14'' muffler and black tip around this time. The 14" Magnaflow sounds just right to me and the black tip added to the black and white look. My favorite cosmetic mod to the truck by far. Chrome is the enemy and this helped out a lot. This only happens every few months. Ditched the teeth rattling spacers, added OME 885's, 90000 and n182 shocks, driver's side trim packer, and cb drop. I have the 10mm spacers on standby if I want them later on. The truck sits more level now and rides better. The cb drop seems a little effective to my takeoff shudder. I also added a 4x4 tundra emblem that I blacked out to rep my 4x4 after removing my mudflaps. I wanted to get rid of the last bit of chrome. I plasti-dipped it to give it a test run of how black would look. I ended up bedlining it black a month or two later. Finally upgraded tire size after the lift. These are 33.6''x11.7". I did NOT chop the cab mount. I had to do the typical inner fender trimming, but have not cut the cab mount. They only barely rub when at full lock on uneven ground or an incline. They are great tires so far, but are annoying to keep balanced sometimes. That's it so far. It's getting closer to where I want it, but still not quite. Thanks for reading and post any feedback, suggestions, or constructive criticism. Good looking truck. Let me know if you get that take off shudder corrected, I've tried c/b drop and shims and neither fixed it. thanks. and will do. i'm not too worried about it, it's not hurting anything on the truck, it's just annoying. i still haven't tried anything yet, but i've looked into it a lot lately. apparently the toytec cb drop and others are basically like the DIY where you put washers on there. so i haven't tried them. but there is a guy on here called beefedtaco and he makes beefier cb drop. i read a lot of reviews from ppl that got it and none were negative, all said that it worked. so check him out on here. Window tint, debadged, fog-lite anytime mod, aftermarket taillights, low profile toolbox modded with three mountain bike mounts, JVC dvd headunit, Kicker hideaway, Fox 2.5" IFP with DSM UCA's, Allpro standard (soon to be expedition) leaf pack, 255/85r16 BFG KM2's, 1.25" spidertrax wheel spacers, powdercoated gloss black TRD offroad rims with color matched center caps. 3 inch suspension lift, 16 inch TRD FJ Cruiser black alloys, 33 X 12.5/16 Swamper Trxus M/T, Line-Xed Toyota skid plate, TRD exhaust, TRD cold air intake, Full tint to match factory tint, In channel wind deflectors, Custom wired hidden XM, Black shorty antenna, Black background headlights, Sockmonkey TRD decals, Kenwood 5120 HU with navigation, Boston Acoustic SL60 front compnonent speakers, SL65 rear speakers, Grillcraft lower mesh grille, Black badging, AromorTech Offroad rear bumper and rear shackle flip kit Access tonnosprt cover, 12 volt power adapter wired in under the dash for standard plug in items. Recently added Devil Horn Toyota Logo, Thanks Andres. Sweet, looks good. I am getting my new tires Saturday, gonna try the 33x12.5's. Any other mods coming in the near future? I mean I know Rome is about an hour to hour and a half from where I'm at, def not as bad as a drive to Macon for sure! hah I've been stopping by the GA section every now and then but your right that's quiet a drive. We could easily get something going towards our neck of the woods. I'm strapped for cash too for the next few years, but I still want to personalize what I can for now. I've been thinking about tinting my tail lights, painting my OEM wheels black, the satoshi grille mod, fog lights anytime, grey wire mod. Let's try and coordinate with some other people and maybe accomplish a couple together. yeah, i've seen a few other guys from north ga on here. but they are not very active on here. maybe we can round them up and get something together. i'm pretty tight on money for now too after getting my wheels. i haven't done much DIY stuff to the truck, but i can try to help. yeah . the backspacing of the wheels made helped out a little though. the previous owner had just put these on when i bought it in march, and i don't really want to let a good set of tires go to waste. but it's eating me up inside to know that i can fit much bigger tires now. i'm thinking about 285s or 295s next time. these need to wear out soon! Great truck man! looks killer! 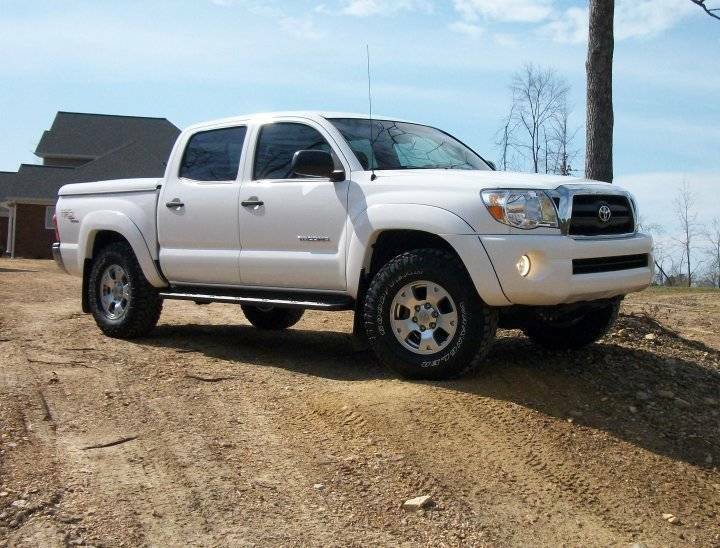 I've got a 2011 white DC Off Road on the way, and it should be here in a few weeks. It will look identical to the way yours looked when you bought it, and my list of immediate mods will have it looking like yours in it's current state. I love the white & black theme. I've been debating on which black wheels to go with, and I've got to admit that your pro comps look mean on that thing. Congrats on a great build & I'm excited to watch it grow! thanks man. it took a lot to get it looking like it does on a part time employee/full time student's budget. but the black and white theme was something i knew i wanted to do as soon as i got it and it has came out looking just as good as i thought it would! good luck with your build.